Brandeis grad students Yue Pan (Chemistry) and Marcus Long (Biochemistry), together with postdoc Hsin-Chieh Lin and Professors Lizbeth Hedstrom and Bing Xu, have extended their previous work on 6 nm diameter magnetic nanobeads (comparable in size to a globular protein). They’ve shown that when decorated with the ligand trimethoprim, the nanobeads can be used to selectively bind to target E coli DHFR fusion proteins, and in addition can be used to manipulate live cells with a magnetic force. This work entitled “Cell Compatible Trimethoprim (TMP)-Decorated Iron Oxide Nanoparticles Bind Dihydrofolate Reductase (DHFR) for Magnetically Modulating Focal Adhesion of Mammalian Cells” is now online in the Journal of the American Chemical Society (JACS). These small, magnetic beads are the first example of solid supported trimethoprim and have numerous advantages over larger traditional beads, including rapid purification, and ultra low non-specific binding. It is, however, their ability to affect live cells that is most important. In the paper they first show that Cos-1 and HeLa cells can be incubated with the beads for over 5 days with little cell death. These cells can subsequently be manipulated by transfection. Finally when exposed to a magnetic force, the focal adhesion of bead-treated Cos-1 cells can be manipulated. 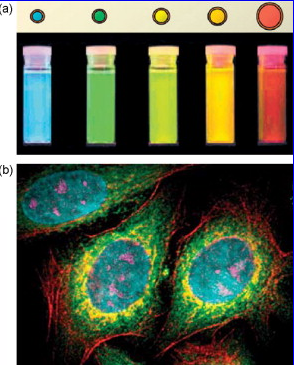 From Bing Xu, one of the new faculty members in the Chemistry Department here at Brandeis, comes a new review on Applications of nanomaterials inside cells. Quantum dots, magnetic nanoparticles, nanowires, the works.